WINGS Flight School provides the local communities with a variety of convenient high quality aviation services. It is our mission to bring affordable services with a strong focus on safety, convenience and fun. 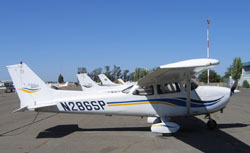 The Aztec is a 1979 6 place aircraft. Description coming soon. Skylane N757ZZ is a Cessna R182 with a 230 hp Lycoming engine. It is a complex aircraft that will be getting a full Avionics Upgrade in Summer 2018. *Pricing per hour will be adjusted after the upgrade. Skyhawk N353ME is a 2000 Cessna 172SP Millennium Edition with a 180 hp engine. It is equipped with a PMA 8000 BT Audio Panel with a 4-place intercom and Bluetooth. It has a Garmin GNC 430 WAAS connected to a slaved HSI, as the #1 Com. The #2 Com is a KX 155A. 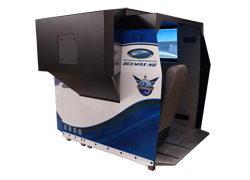 It includes an Avidyne EX 500 Multifunction Display with a moving map. The Transponder is a Garmin GTX 330 mode S with traffic that displays on the GNS 430 Waas and Avidyne. There is a KAP 140 Autopilot with altitude select. It also has two-tone leather interior with four seats. This airplane is rated for instrument flight rules. 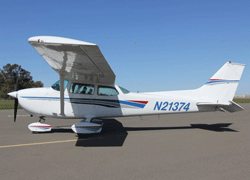 Skyhawk N286SP is a 1999 Cessna 172SP with a 180 hp engine. It is equipped with a KMA 26 Audio Panel with a 4-place intercom. It has a Garmin GNS 430 Waas as the #1 radio and A KX 155A as the #2 radio. The Transponder is a King KT74 mode S with traffic that displays on the GNC 430 Waas and is ADS-B out. There is a KAP 140 Autopilot with altitude hold. It also has a leather interior with four seats. This airplane is rated for instrument flight rules. 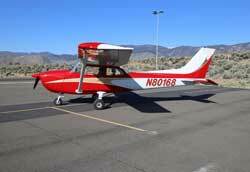 N1897Q is a 1973 Cessna 177RG, certified as Day, Night, VFR and IFR. 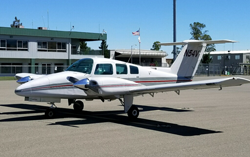 It has a Lycoming 200 HP, with a McCauley 3 Blade Propeller as well as a PS Engineering 8000B Audio Panel, a Garmin GNS 530 GPS, Garmin SL20 Navcom with Glideslope, upgraded Garmin GTX 330ES Transponder with Encoder, ADSB In and Out with weather and traffic. Newly updated interior and custom panel. N9162H is a 1976 172M with a Lycoming 160 HP engine. Summer of 2018, upgraded with PS Engineering Audio Panel, Garmin SL-30 NAV/COM with Glideslope and King KI-208. 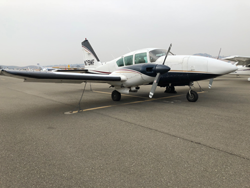 ADS-B compliant and overhauled the turn coordinator, airspeed indicator, horizontal gyro and replaced instrument lighting with Superior Panel Fiberlights. Skyhawk N80168 is a 1975 Cessna 172M with a 160 hp engine. It is equipped with a PMA 8000BT Audio Panel with a 4-place intercom and Bluetooth. The #1 radio is a King KY97A and the #2 is a Narco MK12D. The transponder is an AT50A. This airplane also has a Garmin Aera 510 moving map. This airplane has four seats and is rated for visual flight rules. Skyhawk N9252H is a 1975 Cessna 172M with a 160 hp engine. It is equipped with a Garmin GMA 340 Audio Panel with a 4-place intercom. The #1 radio is a Garmin GNC 430 and the #2 is a Garmin GNC 250XL. The Transponder is a Garmin GTX 330 mode S with traffic that displays on the GNC 430. This airplane also has a Garmin Aera 510 moving map and Tundra Tires. This airplane has four seats and is rated for visual flight rules. Skyhawk N9904V is a 1974 Cessna 172M with a 160 hp engine. It is equipped with a KMA 20 Audio Panel with a 4-place intercom. It has a Garmin 430 as the #1 radio and a KX 155 as the #2 radio. The transponder is a Garmin GTX 327. This airplane has four seats and is rated for visual flight rules. 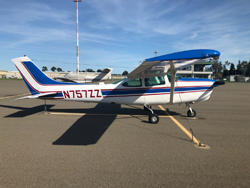 Skyhawk N21374 is a 1974 Cessna 172M with a 160 hp engine. It has a Garmin 430 as the #1 radio and a MX 300 as the #2 radio. The transponder is a Garmin GTX 327. This airplane has 4 seats and is rated for visual flight rules. Skyhawk N724TX is a 1974 172M with a 160 hp engine. It has a Garmin 430 as the #1 Radio, Radio #2 is a KX170. It has a Stratus transponder with ADSB In and Out and a S-TEC Auto Pilot. 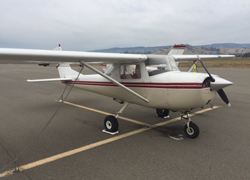 Cessna 150G has two seats and is rated for visual flight rules only. Skyhawk N353ME is a 2000 Cessna 172SP Millennium Edition with a 180 hp engine. It is equipped with a PMA 8000 BT Audio Panel with a 4-place intercom and Bluetooth. It has a Garmin GNC 430 WAAS connected to a slaved HSI, as the #1 Com. The #2 Com is a KX 155A. 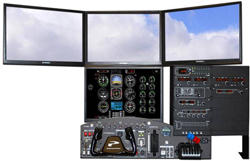 It includes an Avidyne EX 500 Multifunction Display with a moving map. The Transponder is a Garmin GTX 330 mode S with traffic that displays on the GNS 430 Waas and Avidyne. There is a KAP 140 Autopilot with altitude select. It also has two-tone leather interior with four seats. This airplane is rated for instrument flight rules. 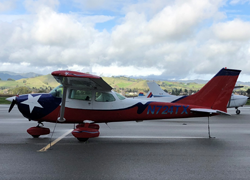 Skyhawk N286SP is a 1999 Cessna 172SP with a 180 hp engine. It is equipped with a KMA 26 Audio Panel with a 4-place intercom. It has a Garmin GNS 430 Waas as the #1 radio and A KX 155A as the #2 radio. The Transponder is a King KT74 mode S with traffic that displays on the GNC 430 Waas and is ADS-B out. There is a KAP 140 Autopilot with altitude hold. It also has a leather interior with four seats. This airplane is rated for instrument flight rules. Skyhawk N9252H is a 1975 Cessna 172M with a 160 hp engine. 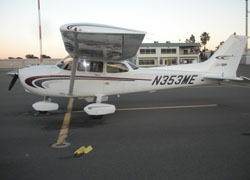 It is equipped with a Garmin GMA 340 Audio Panel with a 4-place intercom. The #1 radio is a Garmin GNC 430 and the #2 is a Garmin GNC 250XL. The Transponder is a Garmin GTX 330 mode S with traffic that displays on the GNC 430. This airplane also has a Garmin Aera 510 moving map and Tundra Tires. This airplane has four seats and is rated for visual flight rules.